Produces professional printing results. Consistent output. Easy installation. Device Types: Laser Printer; Color(s): Cyan; Page-Yield: 7000; Supply Type: Toner. Recycled Comments: Contains an average minimum of 20% total recycled content. 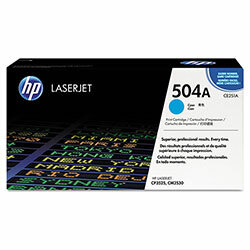 Cyan Laser Toner Cartridges from HP! 164 In Stock today.